Hi. My name is Marshall and don't tell the other bunnies, but I am a favorite of many SaveABunny volunteers. I have overheard the volunteers at SaveABunny "oooh" and "ahhh" about how incredibly handsome I am with my silky jet black fur and dappled coat. Plus, I'm a REALLY nice boy. 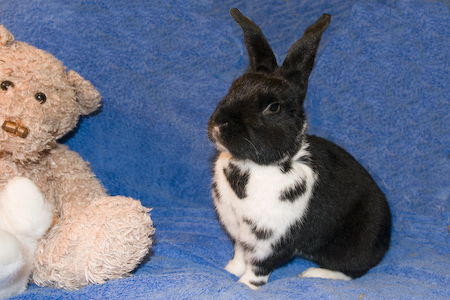 I am a big, muscular, neutered rabbit who is very sweet and loving. I LOVE to be petted and flatten down, close my eyes and go into bunny paradise when I get attention from people. I'm ready to find my forever home and my mellow personality makes me a good choice for both new or experienced bunny guardians.